Born June 13, 1964.in Neculce village from Botosani County. · Member of Cultural Society Junimea 90 Iasi. 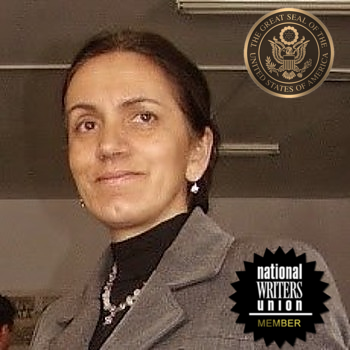 · Corresponding Member of the National Writers Union NWU, USA. She attended the courses primary school in village Galbeni, then the middle school in rural schools Balint and Tătărăşeni commune Havarna. Between 1980 and 1984 following studies at the Pedagogical High School ( Lyceum), "Nicolae Iorga",profile filofogie--history from Botosani, North of Romania. There where has teacher and class master on the poet Maria Baciu. teacher and class master of the Romanian Language and Literature. Between 1990-1994 attended the courses the Ecological University, Dimitrie Cantemir, from Iasi to at the section psychopedagogy where he argue the work of Diploma in mathematics domanin. She working on post the teacher of in 1990 until today. Currently she is professor at the primary school, "Ioanid Romanescu", Româneşti (Rmouneshti phonetic) ,from Iaşi County. In eastern Romania .